May of 2017, we awarded the scholarship to Jacob Gressang, a graduating Special Education student at Seneca Valley High School. Jacob is the son of Gary and Tracy Gressang of Cranberry Twp., PA. He plans to attend Marshall University to study in their Computer Science Program. Jacob is very hard-working as a student, with his activities and also a part-time job. 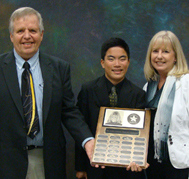 He is the President of the National Honor Society and a member of the Key Club. Jacob is a member of Young Brothers Tae-Kwon-Do with a Second-Degree Black-Belt and also a YMCA Counselor. He also has a part time job at Cranberry Township Shop N’ Save. Jacob is very motivated and self driving to achieve what he wants. As a young teen, he created a local lawn care business in his neighborhood where his clients are very pleased with his work. I’m sure his family and teachers are very proud of him! We wish Jacob all the best with his new venture. In May of 2016, we awarded the scholarship to Alyssa Nusser, a graduating Special Education student at Seneca Valley High School. Alyssa is the daughter of Jim Nusser and Michele Boehler of Cranberry Twp., PA. She plans to attend Butler County Community College to study Cosmetology Management. Alyssa is a very hard-working student that goes above and beyond the requirements in her classes. For her senior project she organized a fund-raiser for the Cosmetology program for the Butler County Area Vo-Tec School with her “Bowl-A-Thon” bowling event. Alyssa attends there studying Cosmetology. She has created and presented information about Cosmetology to younger students and was named Student of Month for December. She has passed her State Boards and has completed her 1250 required hours to earn her Cosmetology Certification License. Alyssa says “Her dream and plans are to own her own salon some day”. I’m sure her family and teachers are very proud of her! We wish Alyssa all the best with her new venture. In May of 2015, we awarded the scholarship to Lance Hahn, a graduating Special Education student at Seneca Valley High School. Lance is the son of Jay and Ann Hahn of Cranberry Twp., PA. He plans to attend Baldwin Wallace University majoring in Music Education. Lance has loved music since he was a child. He is a member of the Choir, Concert Choir, Men’s Chorus, Men’s Quartet, Madrigal Singers, and has sung at Honors Chorus, District, Regional, State and National Chorus. 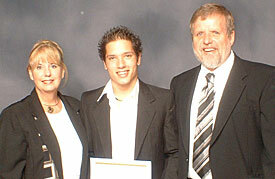 He has performed with the All-National Mixed Choir in Nashville and with the Pgh. CLO on the Benedum stage. He is President of the Madrigal Singers and VP of Tri-M, a National Honor Society for Musicians. He has had a lead role for 4 years in the school’s musicals. He works part time at McDonalds. Lance said, “I hope to share my gifts and talents with the next generation of students and to enable them to experience the same joy I have in their musical endeavors.” I’m sure his family and teachers are very proud of him! We wish Noah all the best in his new venture. 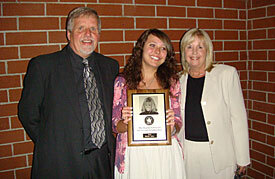 In May of 2013, we awarded a scholarship to Olivia Foss, a graduating Special Education student at Seneca Valley High School. Olivia is the daughter of Robert and Renié Foss of Seven Fields, PA. Olivia will be attending Columbus College of Art and Design. 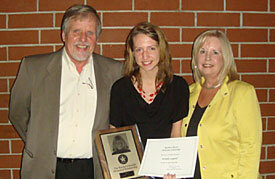 She has been an outstanding student with maintaining a weighted GPA of 4.28 and a class rank of 36. She is a member of National Honor Society, Seneca Valley Reading Competition Team, Library Club, Art Club, Senior Class Plays. Olivia has received the Presidents award for Academic Excellence, Girl Scouts Gold Award, SAT Award scoring in the top 5000 in PA, US Army Youth Leadership Essay Contest, taking 1st place, NCWIT Aspirations Award Runner Up, and various scholastic art and voice awards. She volunteers at the Butler VA hospital as a recreation assistant and food drives, events and bicycle rodeos through Girl Scouts, of which she is an Ambassador. Olivia also has a part time job at Michaels. I’m sure her family and teachers are very proud of her! We wish Olivia all the best with her new venture. In May of 2013, we awarded a scholarship to Rae Butler, a graduating Special Education student at Seneca Valley High School. Rae is the daughter of Carol Butler of Harmony, PA. Rae will be attending PTI where she plans to pursue healthcare or education. Rae is motivated, hard working, and reliable and has had excellent grades with being on the High Honor Roll. She is a member of the International Thespian Society, Art Club, Graphic Art, and Senior Class Plays. Rae has volunteered at Dutilh United Methodist Church Nursery, Teen Helper on K.F.C. Trip, 30 Hour Famine, V.B. School volunteer, Youth Group, and The Pittsburgh Project. She has been involved with JROTC, HOSA (future nurses of America club) and a National American Miss Pageant (PA state finalist) 2010. Rae has participated in numerous summer enrichment programs, including the YMCA Leader in Training Program, an arts program at Nazareth College and VIP Camp, a sports camp for the visually impaired. Rae also has a part time job at her church nursery. I’m sure her family and teachers are very proud of her! We wish Rae all the best with her new venture. In May of 2012, we awarded the tenth scholarship to Ashley Reba, a graduating Special Education student at Seneca Valley High School. 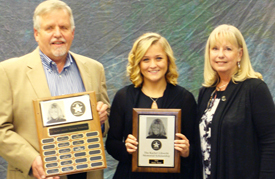 Ashley is the daughter of the late Ronald Reba and granddaughter of Lorraine Reba of Cranberry Twp., PA. Ashley plans to attend Butler County Community College with interest in majoring in English or a child-care related field. 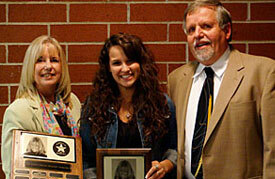 She has been an outstanding student with being on the Honor Roll and Highest Honor Roll. She loves working with children and participates in the Child Development program. She has volunteered at the Cranberry Public Library and has been a member of the Cranberry Township Softball team since she was five years old. Ashley has a gift for language with 4 years of Spanish and 2 years of Japanese. I'm sure her family and teachers are very proud of her! We wish Ashley all the best with her new venture. In May of 2011, we awarded the ninth scholarship to Jordyn Smith, a graduating Special Education student at Seneca Valley High School. Jordyn is the daughter of Joel and Jackie Smith of CranberryTwp., PA. Jordyn will be attending Messiah College to acquire a degree in Early Childhood and Special Education. She has been an outstanding student with being on the Honor Roll, Student Council, Varsity Swimming, Youth Group, Girls Chorus, Concert Choir, and Prayer Group/Bible study along with many other activities. With all of that, she has a part time job at Chick-fil-A and also finds time volunteering to those less fortunate than herself thru her church, community, and youth group. 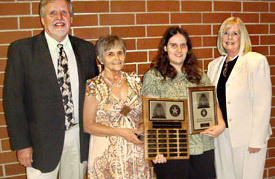 She has done mission trips to New Orleans in 2007 & 2008 and also Nicaragua 2009 & 2010. Jordyn's goals, dreams, and passion is to become a Special Education teacher to help children with learning disabilities. She hopes that someday she will be able to impact children's lives through her teaching. We wish Jordyn all the best with her new venture. 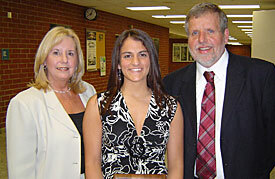 In May of 2009, we awarded the seventh scholarship to Michelle Campbell, a graduating Special Education student at Seneca Valley High School. Michelle will be attending Penn State University (Altoona Campus) to acquire a degree in Sociology. She is very motivated and a hard worker. Besides doing well in the classroom she has also participated in the Marching Band, the Pep Band, Varsity Club, S.A.D.D. (Students Against Destructive Decisions) and the Prom Committee. She has a part time job at CiCi's Pizza and finds time to volunteer at St. John's Specialty Care Center & Church Youth Group. She has been a Girl Scout since she was in kindergarten and has earned her Bronze and Silver Award and is now working on her Gold. Michelle said, "A small act of kindness is what makes this world go round." She also said, "I feel as if I can accomplish anything that comes my way!" 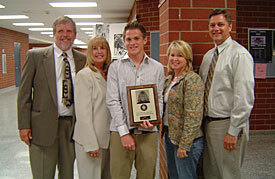 In May of 2008, we awarded the sixth scholarship to Jacob Abramson, a graduating Special Education student at Seneca Valley High School. Jacob will be attending Ohio State University, where he plans to pursue a degree in Science/Biology. Jacob is very motivated and a hard worker. 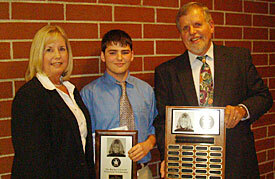 Besides doing well in the class room he has also participated in the Key Club, Fitness Club, and Recycle Club at Seneca. He has a part time job at Red Robin Restaurant and finds time to ring the bells for The Salvation Army during the Christmas season. Jacob is also doing an independent research project at the University of Pittsburgh called Bacterial Phage Hunting which is to find a quicker cure for tuberculosis. Jacob said "The teachers at Seneca Valley have guided me to make the decision that I would like to pursue a career in the sciences." Jacob also said "I will make Rachel proud". 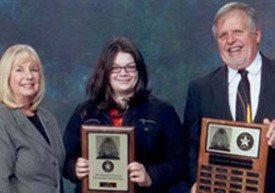 In May of 2007, we awarded the fifth scholarship to Erica Hassen, a graduating Special Education student at Seneca Valley High School and the foundations first female recipient. Erica is the daughter of Jeffrey and Jodi Hassen of Cranberry Twp., PA. Erica will be attending Gannon University in Erie, PA, where she plans to pursue a dual degree in elementary and special education. Erica is an honor student, Vice Pres. of Teens N Tots and on the SV Girls Soccer Team. Erica also has a part-time job at Butler County YMCA working with children in the Child Care Center/Teen Center. Erica volunteers with Circle of Friends, Youth Soccer, and St. Ferdinand Youth Group and church. Erica said the impact of some teachers she had left a lasting impression on her life and she hopes she can change the lives of the children she will teach. 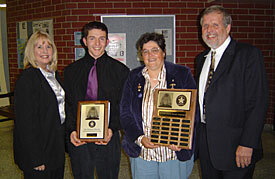 In May of 2006, we awarded the fourth scholarship to Zackary Magill, a graduating Special Education student at Seneca Valley High School. Zackary is the son of Kathy Mason of Zelienople, PA. Zackary will be attending Tack Operator Training School in Butler County, PA, where he plans to further his training in heavy equipment to go on to a career as a heavy equipment operator in the construction industry. Zackary, for his senior project, put in a service road with his own equipment. Zackary's other interests include working a part time job, participates every year in the MS130 Bike Ride, enjoys fishing, golfing and riding his wave runner in the summer months. Zackary also helps his elderly neighbors during the winter months by keeping their sidewalks and driveways free of snow and ice. 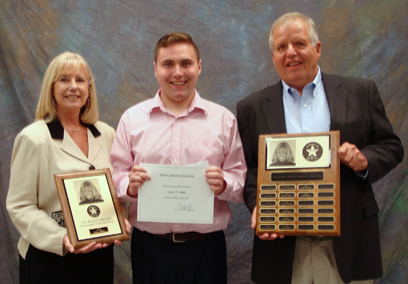 In May of 2005, we awarded the third scholarship to Ryan Elser, a graduating Special Education student at Seneca Valley High School. Ryan is the son of Jeff & Diane Elser of Cranberry Twp., PA. Ryan will be attending Gannon University in Erie, PA where he plans to take up business. He has also been accepted on the Gannon Soccer Team. Ryan has performed successfully on the Seneca Valley Boys Varsity Soccer team and also on the Pittsburgh Strikers Soccer team. Ryan's interests include Youth Group in his church and he also plays the guitar. Special Education student at Seneca Valley High School. 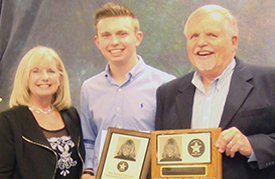 Mr. Rice is the son of Craig and Debbie Rice of Evan's City, PA. Mr. Rice will be attending the American Motorcycle Institute in Daytona Beach, Florida. Mr. Rice's activities are racing dirt bikes which he is ranked 6th int e state, football, wrestling and baseball. Mr. Rice will be working as a machinist during the summer until school starts in the fall. His dream is to own his own Motorcycle Shop. Mr. Rice said, "I am so thankful for getting this scholarship, to be able to continue to follow my dreams and study to become the best I can be. 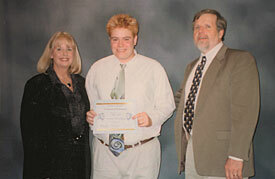 In May of 2003, we awarded the first scholarship to Phillip Voland, a graduating Special Education student at Seneca Valley High School. Mr. Voland is the son of Craig and Lorie Voland of Cranberry Twp, PA. Mr. Voland will be attending Theil College in the fall, majoring in Business and International Business. Mr. Voland activities are Musicals/Plays, Singing Lessons for 7 years, Sign Language, Thespians, Horticulture, Tennis, Working at McDonalds, and his cat "Bally". Mr. Voland had Rachel for English (Modern Humanities). Mr. Voland said "I am so thankful for getting this scholarship because not only does it make me remember Ms. Librecht, but it will make me strive to do my best when I go to college in the fall. This is a one time gift, but I will carry it with me, throughout my like, and I will always remember how much Ms. Librecht meant to me."